Send a bouquet of 13 roses to someone you love. Hopefully they will understand. 13 roses mean there are people who I like and still waiting to be discovered and also mean we can say that we will be your friend forever - even if it is an odd number thirteen. The pronunciation is similar to the Chinese word meaning to life and security is indeed fortunate. 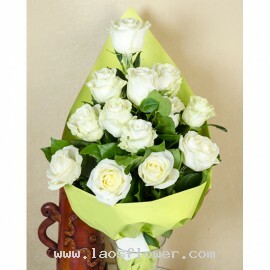 A bouquet of 13 red roses arrange in round shape wrapped with white lamy and white ribbon. 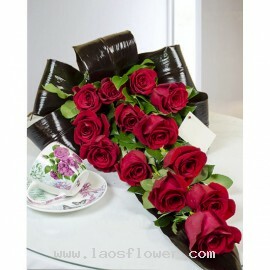 The color of roses and wrapping can be changed by request when ordering. Occasionally, substitutions may be necessary to create your bouquet due to the availability of certain flowers in various parts of th..